Scientists from the University of California, Davis, are deploying “robot larvae” into the ocean at Bodega Bay, just north of San Francisco. These robots mimic clouds of microscopic marine larvae, such as baby crabs, mussels, clams and rockfish. The data the bots bring back provide some of the first direct confirmation of a decades-old and surprisingly contentious scientific mystery: Where do marine larvae go, how do they get there and back, and what allows them to do this? The research carries implications for a range of issues, including managing marine protected areas, fisheries, invasive species and the impacts of climate change. A single female marine organism can release hundreds or thousands of larvae at once. For a century, the prevailing thought was that after the larvae were born, they would drift out to sea much like the seeds from a dandelion flower, with little to no control of their movements. To survive was to win the lottery — only the lucky few could withstand the rough and tumble of the wild ocean and grow to make it back to their adult homes. The idea, though widespread, has gone untested because scientists cannot track microscopic larvae as they develop for weeks while being transported by currents. The lottery idea never made sense to Morgan, however. He had to bridge disciplines, receiving formal training in fields that do not always come together — oceanography and ecology, evolution and behavior — to investigate the discrepancy between what he was reading in his textbooks and what made sense to him. Looking somewhat like Minions, the robots’ bodies are fire extinguisher cylinders painted bright yellow. Skirtlike white fan blades at their “waists” make them spin as they rise or sink, and a gyro inside estimates vertical speed. Sprouting from their black-capped tops are LEDs and a pinger for tracking, and antennas, GPS and satellite communications. Environmental sensors log salinity, temperature, light, depth and swimming speed. The robots, officially called Autonomous Behaving Lagrangian Explorers, or ABLEs, are programmed to behave like a group of larvae throughout their development. Nine of them are currently being deployed by the research team. They were built by Tom and Donna Wolcott, professors emeritus from North Carolina State University. In the late 1980s, the Wolcotts wondered how larvae of Bermuda’s land crabs got back to these isolated islands. Morgan also reached out to UC Davis oceanographer John Largier, who has been working to map the water flow patterns that larvae can exploit in coastal upwelling regions, such as those off California. The robot larvae, which Morgan and his colleagues have been deploying for hours or days at a time, reveal that larvae control their movements by swimming vertically. They also stay much closer to the shoreline than expected. Larvae of most species go only a mile from shore rather than far out to sea, as was once thought. They move up and down in the water column and return toward the shore using currents like a conveyor belt. Most stay below the strong surface currents to avoid getting carried out to sea. 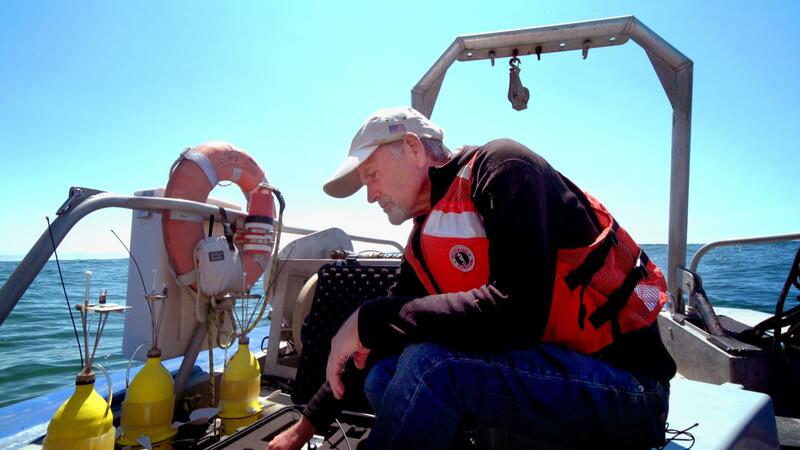 Rick Grosberg, director of the UC Davis Coastal and Marine Sciences Institute and a professor of evolution and ecology, has also spent much of his career studying marine larvae. “At this point, I can tell you pretty much where a larva came from,” Grosberg said. “But I can’t tell you how it got there. I have no idea. There’s this pervasive belief that larvae are pathetic and there’s very little they can do to control their fate. Morgan’s work is the first serious step in the complex world of the coastal ocean to show that is not so. The research is supported by the National Science Foundation. The development of ABLES previously was funded by NSF, the National Oceanic and Atmospheric Administration, and the U.S. Environmental Protection Agency.